The movie of Les Miserables starring Hugh Jackman and Russell Crowe is currently being shot in the UK prior to it moving to France. 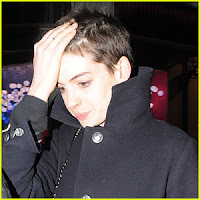 The American actress Anne Hathaway is playing the part of Fantine and it appears she is taking the role very seriously as she has been on a very strict diet to lose weight for her latter scenes when she becomes ill and dies, and has also been spotted this weekend sporting a new very short hairstyle. The storyline goes that her character is a struggling factory worker who is forced to turn to prostitution to provide for her illegitimate child and ends up selling her hair for money so it is more than likely the new crop is for her art.